Acclaimed for its frank and fascinating investigation of racial identity, and reissued on its ten-year anniversary, Notes from No Man’s Land begins with a series of lynchings, ends with a list of apologies, and in an unsettling new coda revisits a litany of murders that no one seems capable of solving. Eula Biss explores race in America through the experiences chronicled in these essays—teaching in a Harlem school on the morning of 9/11, reporting from an African American newspaper in San Diego, watching the aftermath of Hurricane Katrina from a college town in Iowa, and rereading Laura Ingalls Wilder in the Rogers Park neighborhood of Chicago. What she reveals is how families, schools, communities, and our country participate in preserving white privilege. 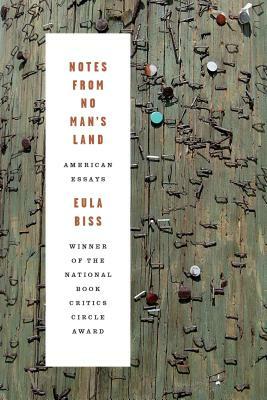 Notes from No Man’s Land is an essential portrait of America that established Biss as one of the most distinctive and inventive essayists of our time. EULA BISS is the author of The Balloonists. She teaches nonfiction writing at Northwestern University and is co-editor of Essay Press. Her essays have appeared in Harper's and The Believer. She lives in Chicago.